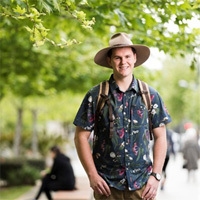 I have just completed my Bachelor of Science (Advanced) at The University of Adelaide with a Botany and Soil Science major. The next stage of my research career is to begin a Master of Philosophy by research at The University of Adelaide. From here I plan to upgrade this to a doctoral candidature after the first 18 months of study. The focus of my research will be on investigating and developing new cultivars of Leptospermum scoparium to produce Manuka honey within Australia. This project will give me the chance to improve and develop new analytical and practical skills through the interactions with experience research scientists and through problem solving. It will also give me an opportunity to utilise skills and knowledge that I have gained from being a passionate gardener, plant collector and science enthusiast. I look forward to this amazing opportunity to assist in establishing a new industry in Australian agriculture.